As part of Q4 and their Christmas collection, Yankee Candle released four new festive scents. Bundle Up - a scent of fresh linen with a touch of citrus. Cozy By The Fire - a warm mix of ginger, clove and orange combined with wood notes. Winter Glow - scent of frosted leaves on snow covered trees with a strand of evergreens. Along with Berry Trifle, which is still currently available so I thought I'd pop a little review incase anyone's interested in getting it whilst you still can. As I tend to favour fruity food scents, this is the one that appealed most to me. I ordered it online without testing the scent in person as I knew it would be my kind of thing. 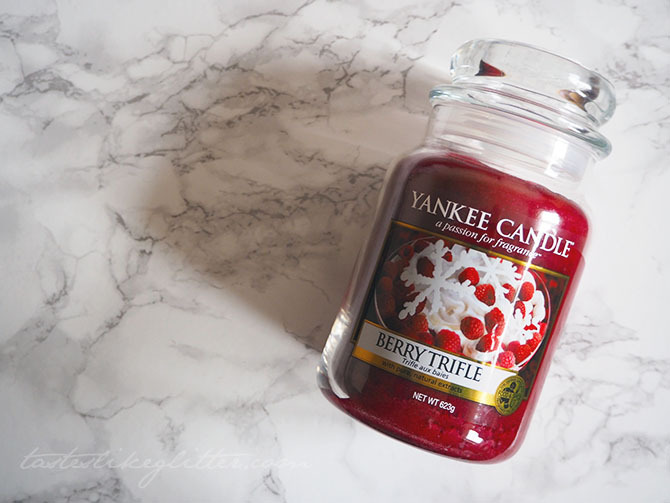 Berry Trifle brings us an offering of fresh, tangy berries mixed with soft swirls of vanilla cream. The scent of this isn't as strong as most Yankee scents, meaning that the throw isn't as powerful. I burn all my candles in my bedroom so whilst I find no problem with it, if you're looking to burn this in a larger sized room you might want to go for a different scent. The berries and the vanilla mix well together, giving a different take on the usual fruity scents that Yankee provide us with. Whilst I'm glad to have purchased it there is definitely scents I prefer over this. If you've been meaning to buy it, it's currently available from House Of Harris with a little bit of a discount, as well as some other online shops.